In spirits, the name 'cognac' has long been a byword for quality. But what exactly is it that makes cognac... cognac? The answer is a jigsaw puzzle. Can it be the grape? Yes and no. Ugni Blanc, the variety used to make most cognac, gives it a spicy, floral character. But more important is the way this differs across the Cognac region. The region is divided into six zones, or crus, that radiate from the town of Cognac. 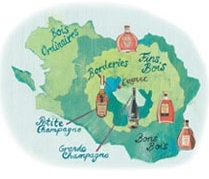 In order of importance, the zones are: Grande Champagne, Petite Champagne, Borderies and Fins Bois (the two outer crus, Bois Ordinaires/Bois Communs and Bons Bois, are less relevant). The spirit from each cru is different. This geographical character, known as terroir, depends largely on the chalkiness of the soil. The two Champagne crus are chalk-rich and produce eaux-de-vie (double-distilled white wines), which need long cask-ageing to reveal their perfumed complexity. Borderies' mix of clay and chalk soils makes for weightier, nutty brandies with an earthy perfume. Fins Bois is made up of heavier clays, which give fuller, quicker-maturing brandies. There are, however, 'islands' of chalk in Fins Bois, producing a delicate, fruity cognac, the equal of many from the Champagne crus. Each cognac house can focus on one cru, or blend between them to create its own style. For instance, Martell VS, is mainly from Borderies and has a clean, dry weight, while Courvoisier VS, is from Fins Bois and Borderies, and is richer. Though the role of the crus is vital, each firm also has its own recipe on how to distil, mature and blend to achieve the house style. It is distillation method that helps produce the ripe, fruity style of Hennessy Fine de Cognac. 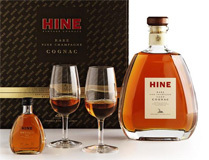 And though Hine Rare VSOP and Rémy Martin VSOP are champagne cognacs, their styles are very different: the Hine has balanced elegance, while the Rémy Martin concentrates on subtle, spicy and floral length. So, the final piece in the quality jigsaw is, strangely, the forgotten one: that of human artistry.